I can’t believe I’m actually writing this! It has been announced via the below image from Sno*Drift that NBC Sports will be carrying coverage of the entire Rally America National Championship series! 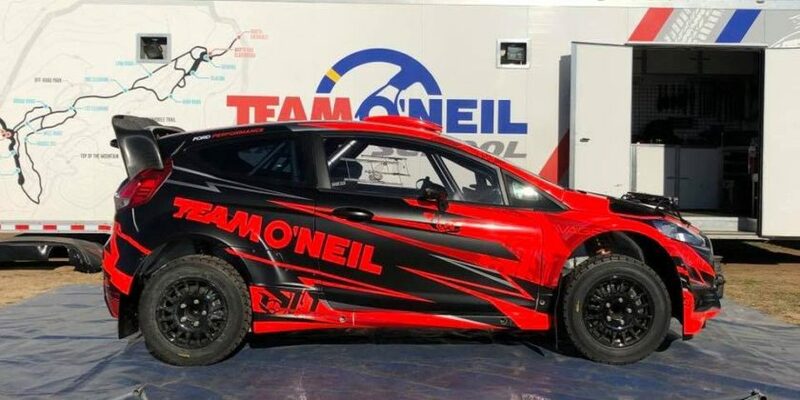 As our very own Doug Patterson posted in a reply to Andrew Comrie-Picard a couple of weeks ago “With as many outlets as are available now, surely someone would be willing to pick up a 30-min or hour highlight show for the Rally America events, right?” Apparently Doug was spot on, but this is one better. It isn’t one of the more obscure motorsports channels televising these rally events, but none other than NBC Sports! These will be edited recaps produced and filmed by Bend, Oregon’s Rage Films who are known for filming extreme sports like back country skiing, snowmobiling, kite boarding, etc. Reminds me a bit of Warren Miller’s stuff. 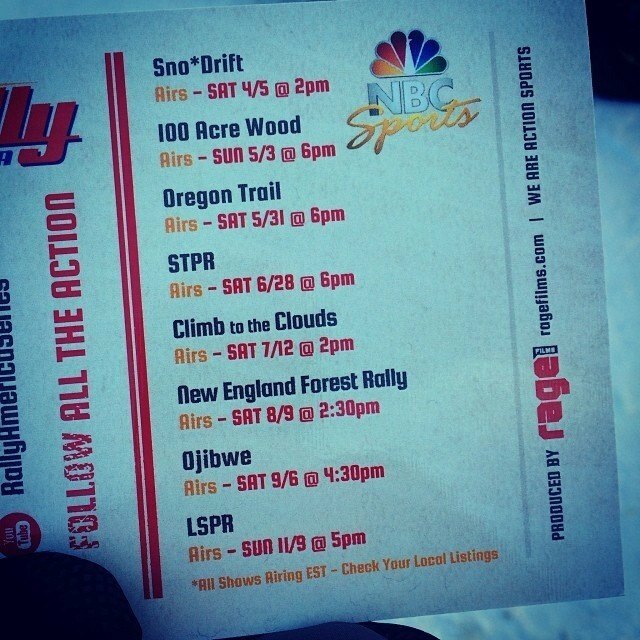 At first I wasn’t 100% sure this was legitimate, but Rage is definitely at the event and posting all kinds of images about filming in the icy cold of Sno*Drift on their Facebook page. 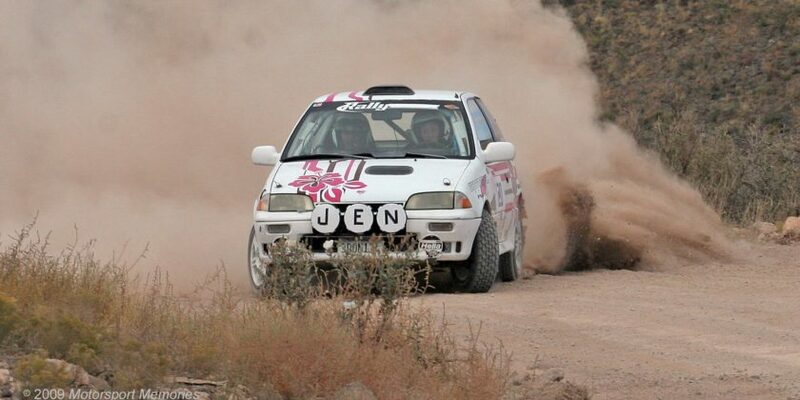 Could this change the entire outlook for Rally America and rally as a whole in the USA? Will more sponsors step up to help pay the costs for more teams to compete at the national level with TV coverage? Sure it isn’t live, but national TV is national TV. We’ll have to wait and see, but for now I’m not complaining!! Wow! And they got the whole season on a semi-legit network! I’d have been happy if they’d found coverage anywhere, even on MAVTV. I remember listening to the last podcast , you guys were talking about how Rally America is in trouble if they don’t get a tv deal…someone must have been listening to you guys! I don’t know if they would be in trouble without TV, but we were in agreement that it reminded us of IndyCar where the series has remained stagnant with little growth even though the competition is good. A number of last years’ champions or championship contenders stated they weren’t going to compete for the national championship in 2014 due to the costs and the lack of media coverage. Drivers and teams do come and go, but TV should add stability because sponsors should be willing to pay more for the national coverage. My hope was that TV from the growing Global Rallycross Championship could migrate easily to stage rally as their big name drivers like Ken Block and Travis Pastrana like racing both disciplines. Apparently my guess was right, as I saw a post from Sno*Drift with GRC correspondent Katie Osborne doing interviews during service stops and at the finish. The big question is, now that there is TV, will the sponsors help pay for more teams to get involved in the series? Will we see better and more competition? Block said he isn’t doing the entire series due to schedule conflicts from his sponsors. I’m hoping Ford insists on him doing the entire RA series to try and beat Subaru’s Higgins and Pastrana. L’Estage needs to be more competitive as well. He’s a fast driver, but his EVO X is not as advanced as the Fiesta HFHV or the WRX STi. My other concern is whether or not they will cover the other classes of Super Production and 2wd. With Ford and Scion backing 2wd and drivers Matt Johnson and ACP having TV experience, I’d bet they get some camera time. Super Production on the other hand, which has some of the best and closest competition, doesn’t have household names and hopefully doesn’t get overlooked. We’ll have to wait and see what this TV product looks like, but nonetheless I’m super excited and will have my DVR set!